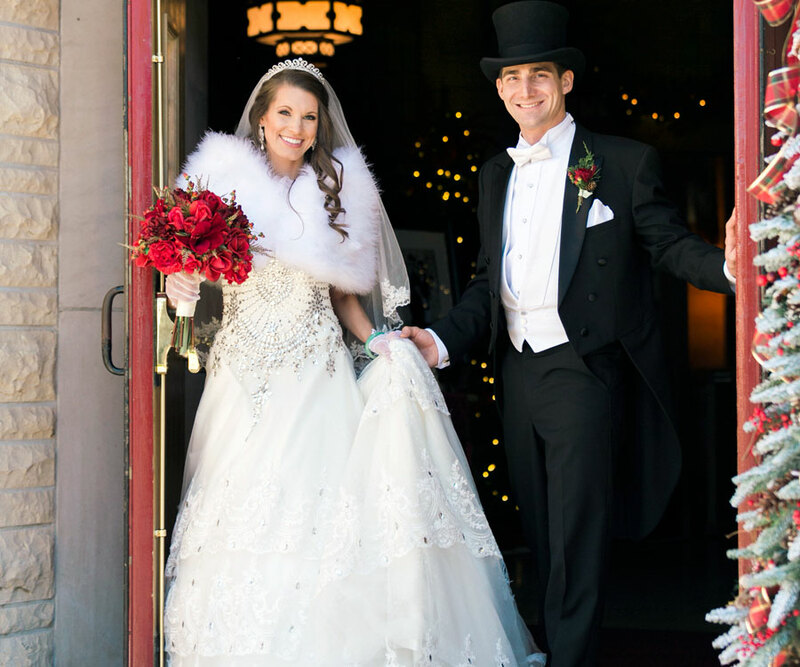 Megan Williams and Victor Jantz held a holiday-themed ceremony at College of the Ozarks for their December wedding. Victor and Megan Jantz met on the stage. The two were cast as the male and female leads in a production of Once Upon a Mattress at Branson’s Tri-Lakes Community Theatre, and at that time, Megan wasn’t looking for love. Victor had other ideas. “He, of course, loved me immediately,” Megan says with a laugh. When she realized that she couldn’t stop thinking about Victor, their relationship bloomed quickly. 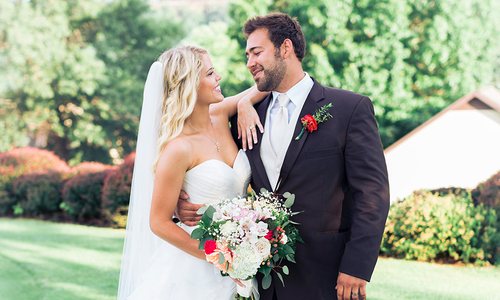 Their showmance resulted in a sweet engagement and a truly dazzling wedding. 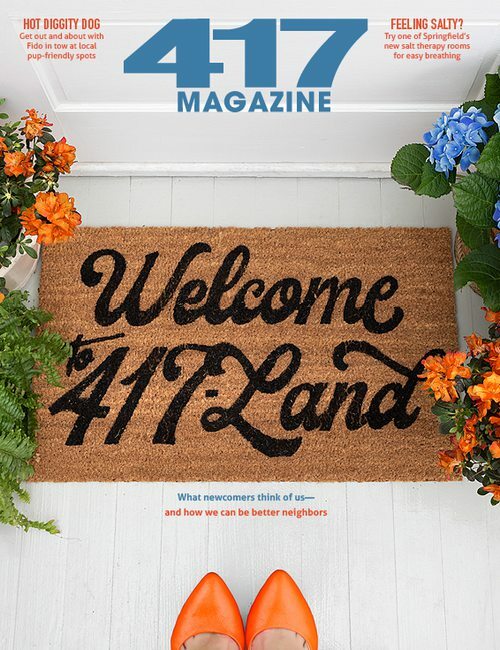 After an eight-month separation when Megan temporarily moved to Washington, D.C., the couple found their bond solidified. 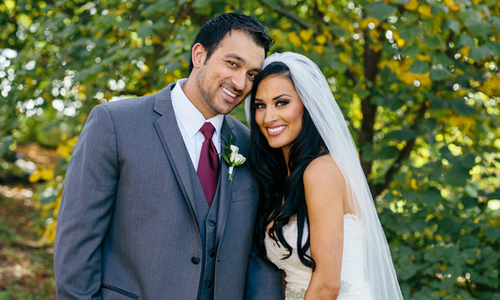 Megan moved back to Branson to be with Victor, and he proposed about a year into their relationship. On December 8, 2014, they were heading to dinner at Top of the Rock. Before they could settle in at Arnie’s Barn, Victor squired Megan to the majestic Chapel of the Ozarks to pop the question. 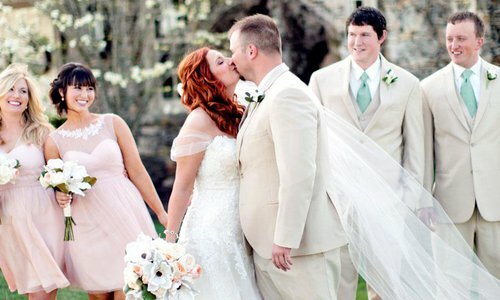 “The sun was setting in front of the window in the chapel, and it was so beautiful,” Megan says. “And he said, ‘I could just marry you.’” At that point, he got down on one knee and proposed while Megan’s close friend captured the moment on camera. 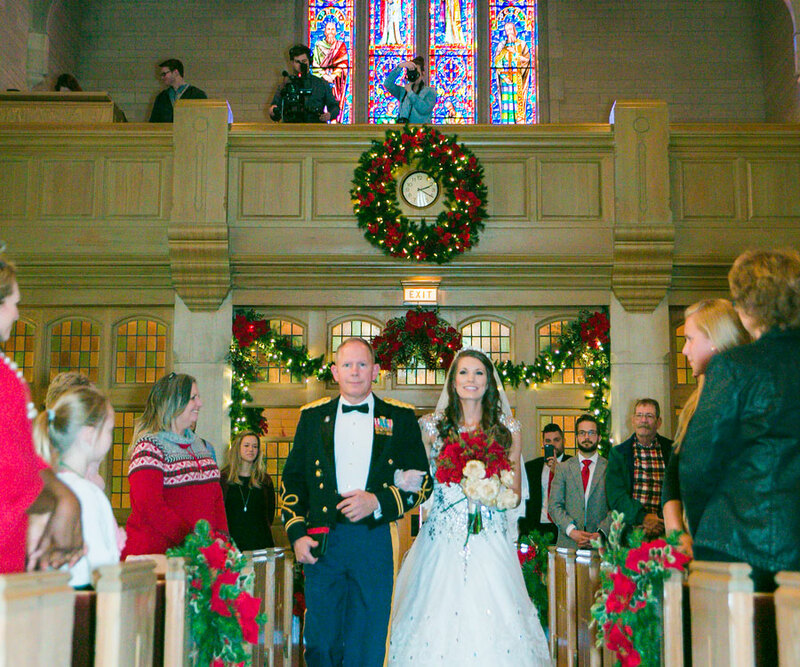 On December 5, 2015—almost exactly one year later—the couple celebrated their love with a classic Christmas wedding at Williams Memorial Chapel at College of the Ozarks. 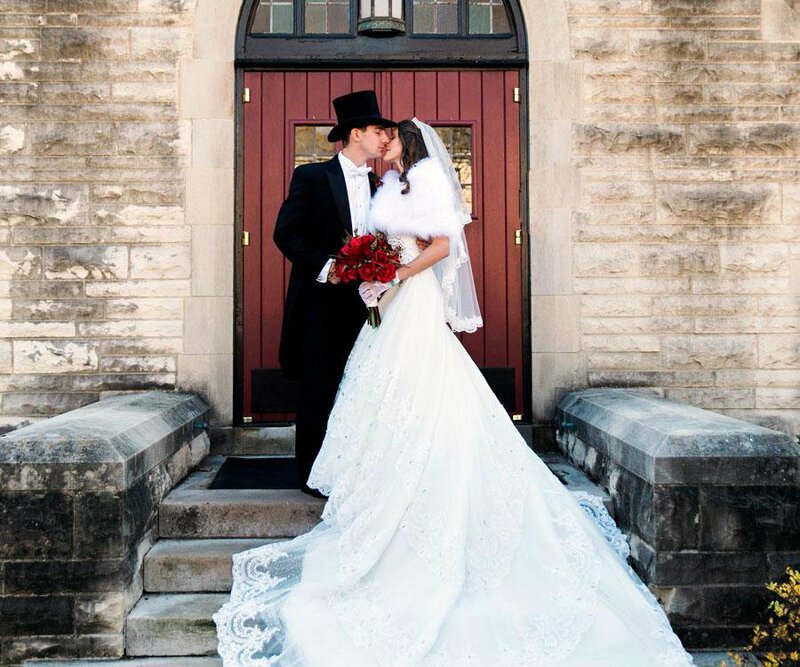 The wedding was every bit as unique as the Jantz couple and was decadent down to the last detail. “I remember every single detail,” Megan says. 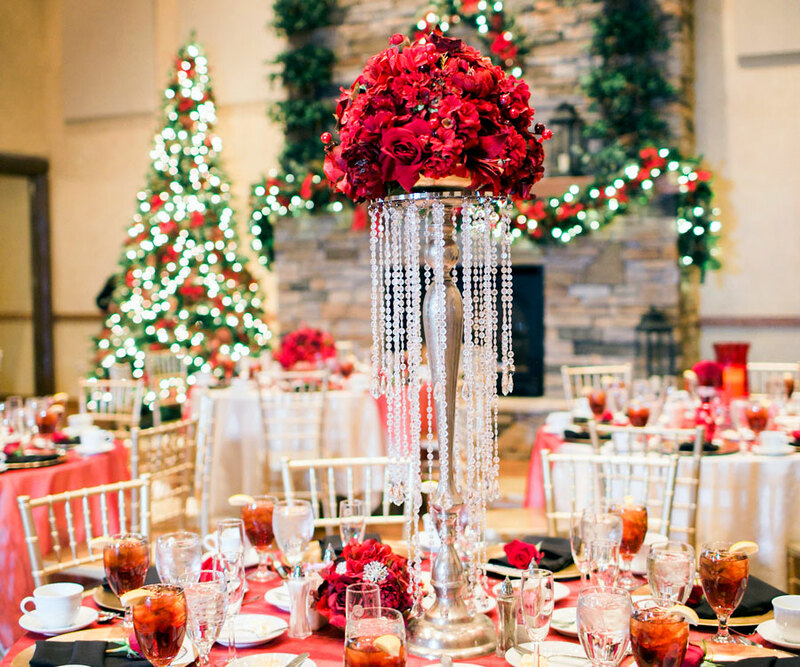 “A lot of brides say that their wedding was a blur, but I was taking a lot of mental pictures.” The couple celebrates their first anniversary this holiday season, and they’re undoubtedly looking back on a true crowd-pleaser of a wedding. 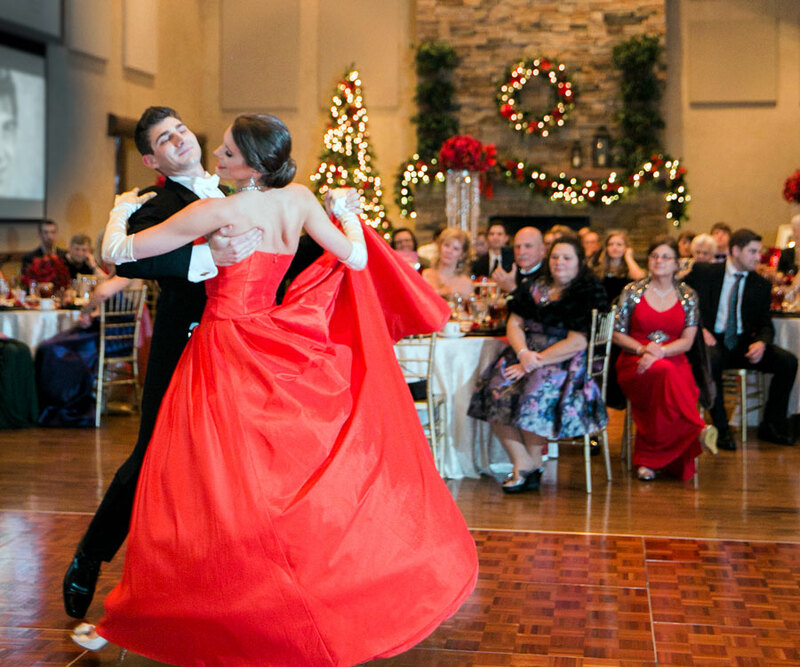 For the reception, Megan changed out of her winter white gown and into a dazzling holiday-inspired ball gown from Lulia Boutique. 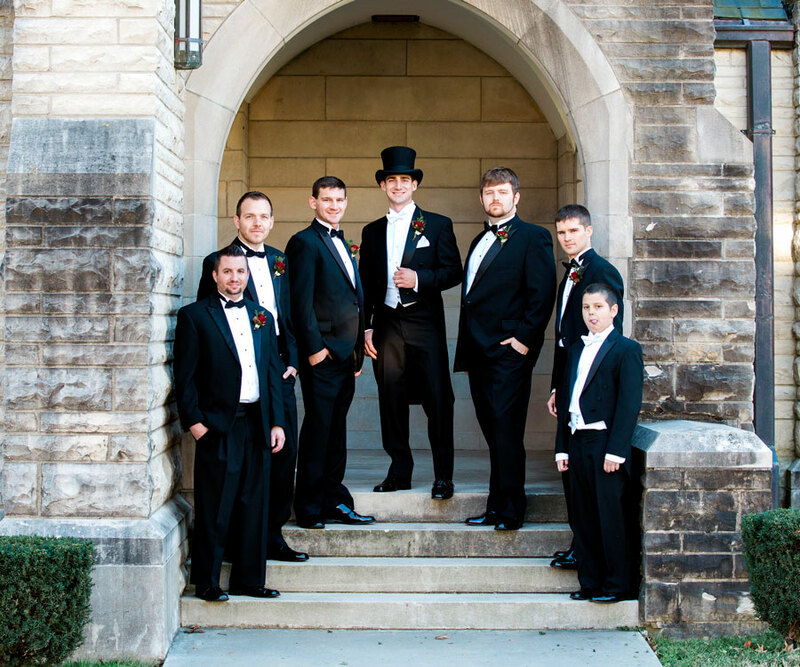 Best man Andrew Jantz and groomsmen Cody Boggs, Jordan Bright, Greg Lilley and Keith Smith were suited up in tuxedos from Touch of Class in Branson. Ring bearer Luke Smalley joins the group for a photo. Victor and Megan emerge from Williams Memorial Chapel as husband and wife. 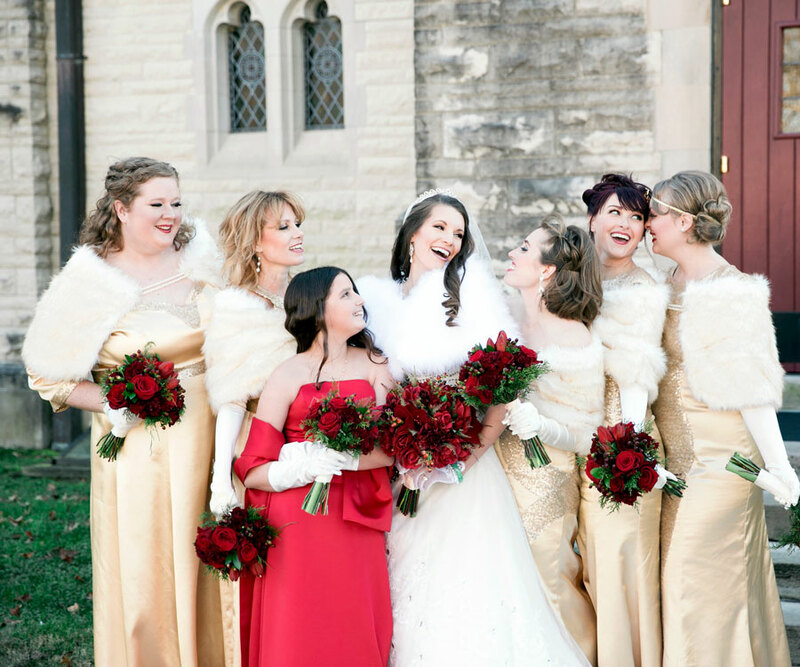 The bride celebrates her big day alongside her bridal party, which included maid of honor Kelli Roberts, junior bridesmaid Alex Smalley and bridesmaids Somer Dean, Lana Kroll, Brianne McGill and Rachel Way. 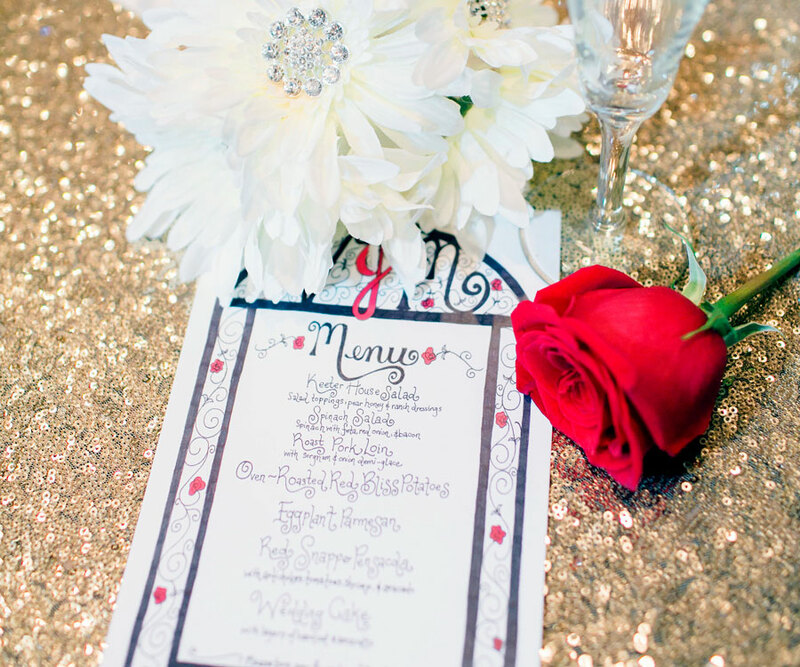 The black-tie dinner menu included indulgent fare from The Keeter Center. The savory menu items included eggplant Parmesan and roasted pork loin. 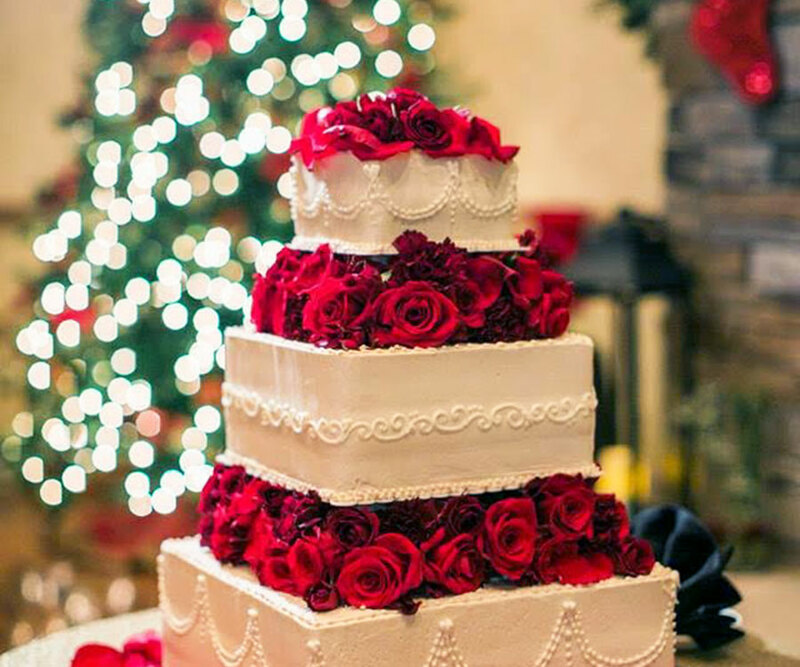 Guests had their pick of two delicious cakes at the reception: the bride’s cake (pictured), which featured three layers of hazelnut, red velvet and amaretto cake with a buttercream icing, and the groom’s option, which also featured red velvet cake and buttercream icing. Tea Time: The Jantz wedding was truly classic with an afternoon tea following the ceremony and a black-tie dinner and reception following the tea. 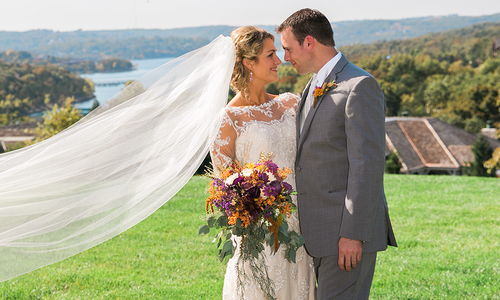 The College of the Ozarks Chapel gave Megan and Victor the perfect backdrop for their union. 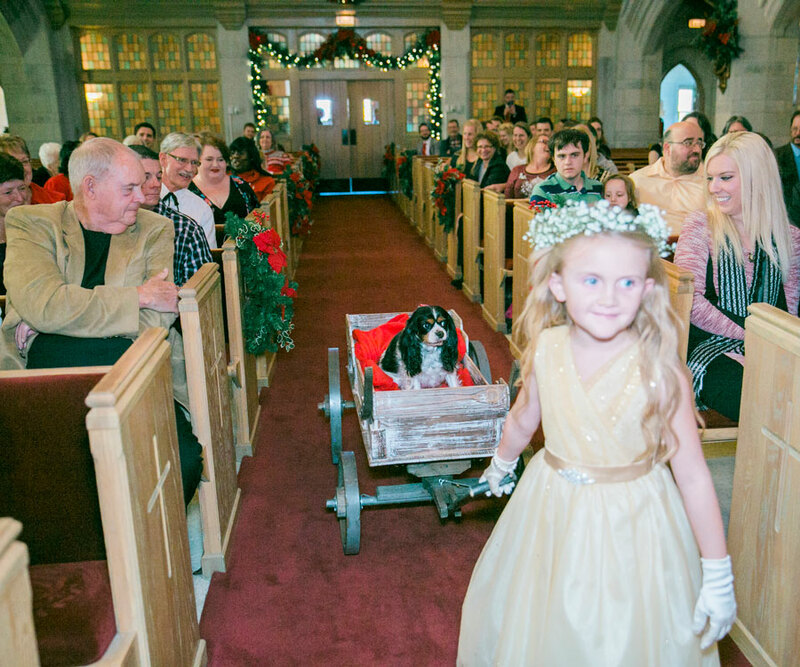 Megan’s dog, a cavalier King Charles spaniel named Ebony, rolled down the aisle in a buggy pulled by a flower girl. The youngest flower girl had refused to get in the buggy, so Ebony filled in. Megan’s mother passed away in 2010, so Megan passed white roses to women who stood in as maternal figures after her mother’s death. 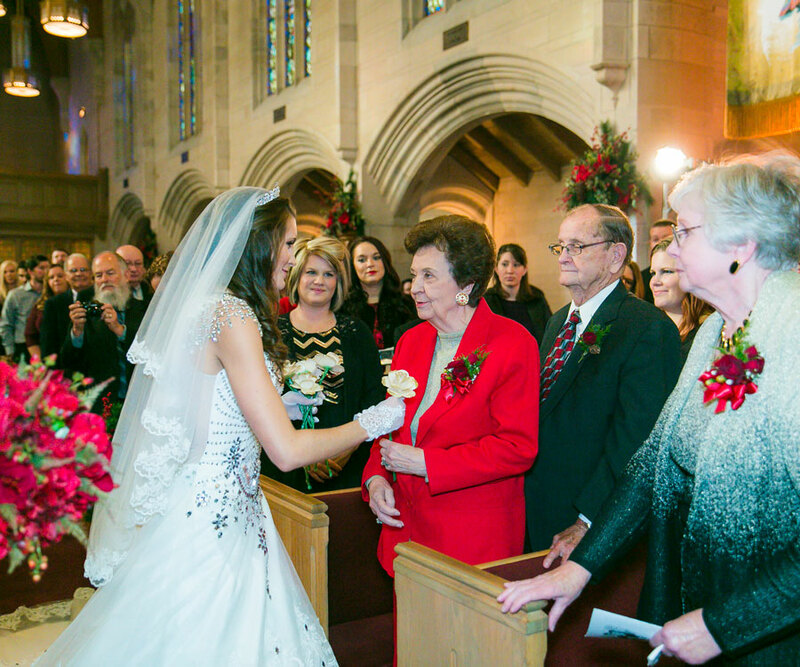 She laid the final rose on a table with photos of her mother and a bust holding her mother’s wedding dress. 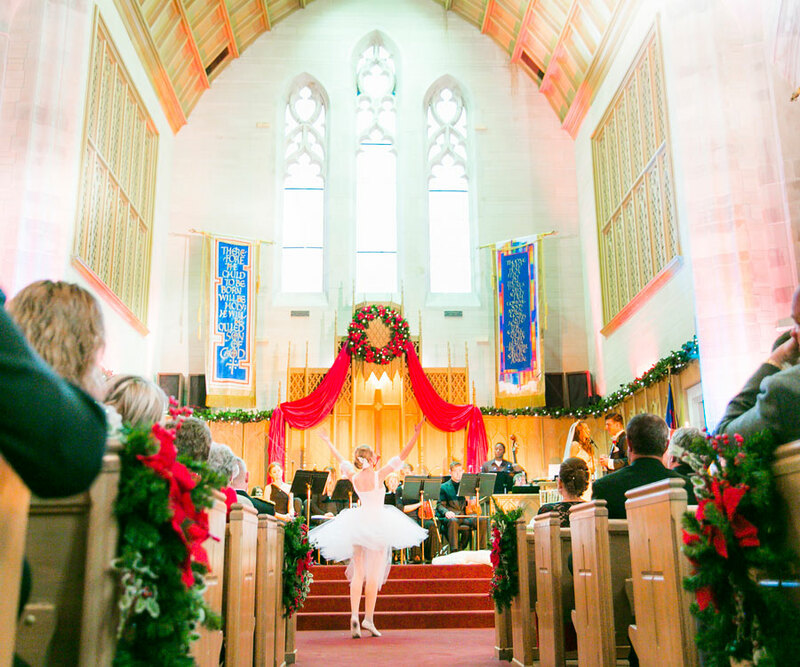 The couple wanted music to be central to their day in the form of a 30-member choir, a 17-member orchestra, a choir of handbells and a rendition of “The Lord’s Prayer” sung by Gregg Busch, accompanied by a single ballet dancer. 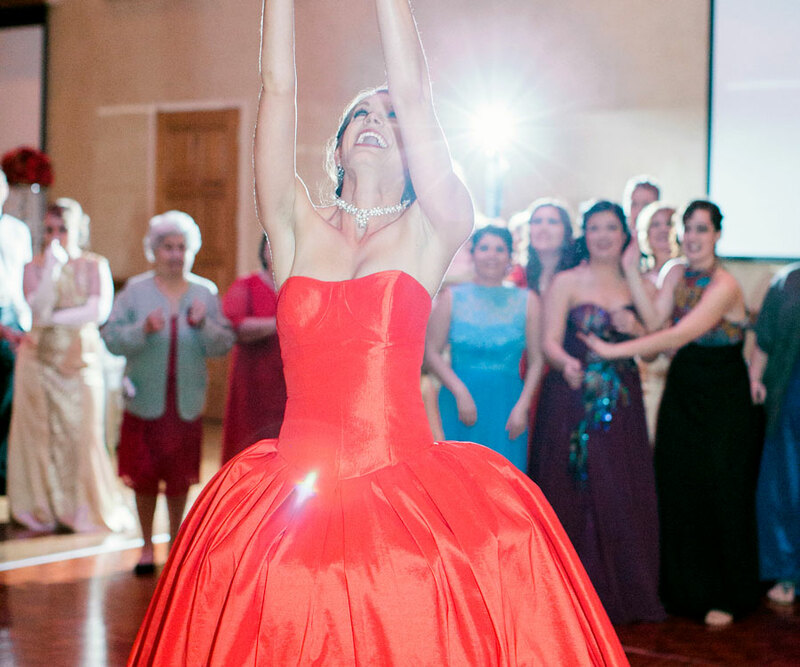 After the wedding ceremony, Megan changed into a festive custom-made reception dress to dance the night away.